I purchased this yarn from another yarn supplier in the USA. It's Fleece Artist Merino 2/6 and the colour is Puffin. 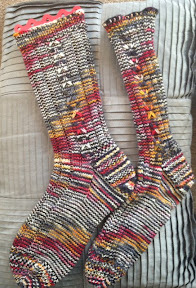 The pooling and striping when it has been knitted up makes the socks quite unusual. I hope the recipient will find them funky.